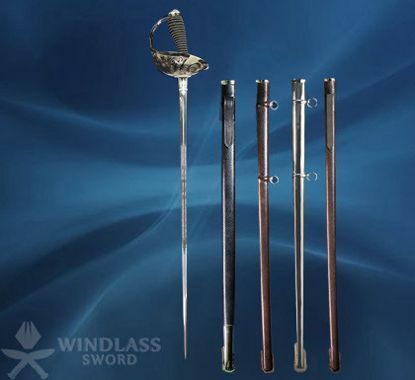 Our high quality military swords, cavalry sword are manufactured using traditional methods, some dating back hundreds of years. 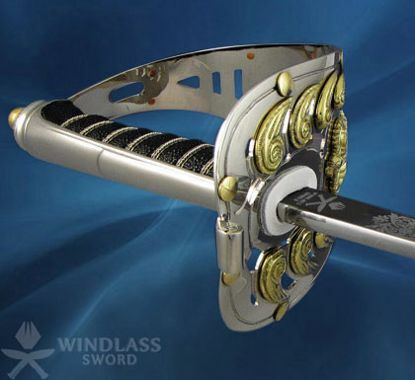 At each stage of production, every Windlass sword undergoes quality checks by our team of inspectors to ensure that it meets all the requirements of the UK Ministry of Defence specifications. 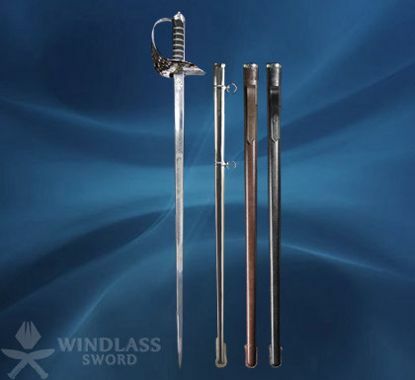 Windlass Sword is the only UK company that can supply every military swords and cavalry sword pattern currently used by the British Armed Forces. Our ISO 9001 accredited facility in India has, since 2008, been the sole supplier of swords purchased by the UK Ministry of Defence. Since that time our swords have been seen at all the big state occasions, including the wedding of the Duke and Duchess of Cambridge, Trooping the Colour and State Opening of Parliament. As well as British Pattern Military Swords, we welcome inquiries from officers and defense departments across the world. Our collection of military swords for sale includes the British military swords UK, cavalry sword, claymore swords. This magnificent piece of work was last amended in 1897 and is widely renowned for its design and build. 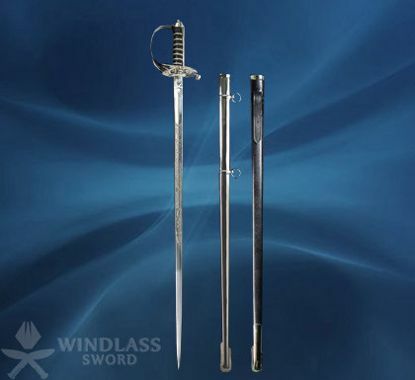 Manufactured from carbon steel, the blade of this sword is double-edged at the end of its length and daintily engraved with the regimental crest. A wonderful characteristic about this sword is that the guard of the three-quarter basket hilt is penetrated and etched with a scroll design that incorporates the royal cipher of the current sovereign and is shaped from nickel-plated steel. The grip is meticulously crafted in black fish-skin and clenched with silver-plated copper wire. The Infantry Officer’s Sword can be worn with the assistance of a Sam Browne leather scabbard with plated steel mouthpiece for service wear or in a beautifully nickel-plated steel scabbard for formal full dress occasions. The pattern of Infantry Sword 1845 underwent a slight metamorphosis resulting in the current Brigade of Guards Sword which was approved in 1854. Designed in steel finish, it was devoid of hinged flap containing the individual guard's regimental badge on the cartouche. However the Dress Regulations of 1857 ordered that the blade of the sword should be “embossed” with battle honours and regimental badges, the tradition which is preserved till date. The design and pattern of the existing Brigade of Guards Sword was commended in 1854. The Coldstream Guards' Sword is also commonly referred to as the Brigade of Guards Sword. It is a lesser known fact is that this particular sword was in fact a steel version of the 1845 Infantry pattern sword excluding the hinged flap but with the individual Guard's regimental badge in the cartouche. It was not until the Dress Regulations of 1857 that the blades of Guards' swords were ordained to be embellished with their regimental badge and battle honors. A distinct characteristic which has remained to this day. 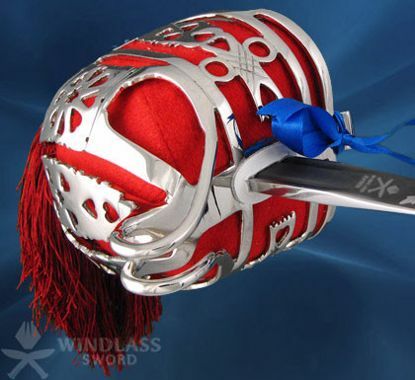 Even till this very day, Brigade of Guards Sword is carried in an exquisite nickel plated steel scabbard with shoe, mouthpiece and two suspension bands and rings. The sword is also offered with a leather Sam Browne scabbard which is highly recommended for service wear. Following their rich history and tradition, the Scots Guards Pipers wear an incredibly unique dirk. It is said that the design and pattern of this Dirk originated from somewhere between the Piper's Dirk worn by the Pipers of The Royal Regiment of Scotland and the more sophisticated dirks adorned by their Officers. However, its must be noted that this pattern is not regulated but worn by customary tradition. The grip which has been carefully hand carved in ebony in the traditional 'Thistle' shape and hatched and embellished with nickel silver studs adds more glory and stateliness to the Dirk. The Dirk is also characterized by a forward leaning pommel on to which the majestic regimental badge is affixed. A stunning feature of the Scots Guards' Pipers' Dirk is that it's blade is made of polished steel and the scabbard which is beautifully covered in patent leather has plain nickel silver top and knife and fork mounts. The knife and fork are clung on to the scabbard using a nickel silver chain and have their grips engraved and hatched and dazzled with nickel silver studs and the pommel is adorned with a miniature, but ever-glorious, regimental badge; all of which add a surreal majestic beauty to the Dirk. They are the crowd of Irishmen, whose fame is renown. These lines are testimonial of Irish Guards' regimental history. There has been a transition in their weapons with the changing time. The current Brigade of Guards pattern of sword was approved in 1854. It was a steel version of the 1845 Infantry pattern sword. The blades of the swords are etched with regimental badge and battle honours bestowed on the individual guard during his military reign. 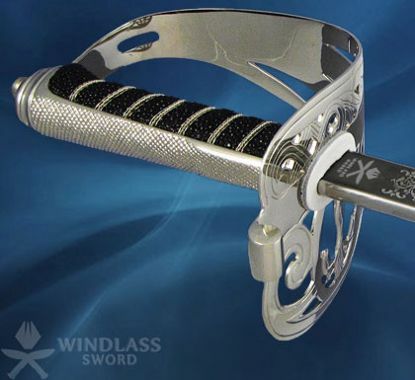 The sword is carried today in a nickel plated steel scabbard with shoe, mouthpiece with two suspension bands and rings. The sword is also available in leather finished Sam Browne scabbard for service wear. The design and pattern of the existing Brigade of Guards Sword was commended in 1854. It is a lesser known fact is that this particular sword was in fact a steel version of the 1845 Infantry pattern sword excluding the hinged flap but with the individual Guard's regimental badge in the cartouche. It was not until the Dress Regulations of 1857 that the blades of Guards' swords were ordained to be embellished with their regimental badge and battle honours, a distinct characteristic which has remained to this day. The design and pattern of the existing Brigade of Guards Sword was commended in 1854. The Welsh Guards' Sword is also commonly referred to as the Brigade of Guards Sword. It is a lesser known fact is that this particular sword was in fact a steel version of the 1845 Infantry pattern sword excluding the hinged flap but with the individual Guard's regimental badge in the cartouche. It was not until the Dress Regulations of 1857 that the blades of Guards' swords were ordained to be embellished with their regimental badge and battle honours, a distinct characteristic which has remained to this day. The sword is also offered with a 'leather Sam Browne' scabbard which is highly recommended for service wear. 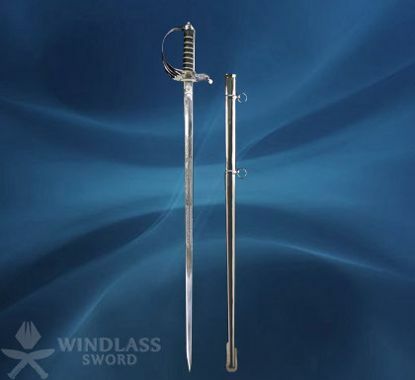 Due to the supremely stable design of the Rifle's Sword which consists of a straight carbon steel blade embellished with the regimental crest, it set a standard among swords which was later adopted by the All Guards Regiments. It set a landmark thanks to its excellent majesty design and pattern. The exquisite nickel-engraved steel guard of the Rifle Regiment Sword is carefully pricked and embellished with a scroll pattern that inculcates the regiment's very own cypher in lieu of the Royal cypher. Likewise, Guards Hilts exhibit their own particular cypher in the hilt. The grip is meticulously crafted in black fish-skin and clenched with silver-plated copper wire. This magnificent piece of work is available in a beautifully nickel-plated steel scabbard for formal full dress occasions. The Rifle regiments adopted the 1822 pattern of Infantry sword. Later in 1827, some modifications were made in the existing design of the sword for The Rifles. The layout being the same, the hilt was crafted in steel instead of gilt brass. The Royal Cypher was also replaced by bugle-horn suspended with a string. The sword of the regiment of Gurkha Rifles in the pre 1947 Indian Army bore a steel hilt with a cartouche depicting the stringed bugle-horn surrounded by a plain oval. However, the sword of 5th Gurkha Rifles who copied the British Army Rifle Brigade had a wreathed oval surround to the cartouche of the sword hilt. Presently the Gurkha officers- the finest and most feared soldiers, carry the former Rifle pattern sword having a cartouche surrounded by a plain oval. The Honorable Artillery Company (HAC) Sword is modeled on the basis of the Guards sword. 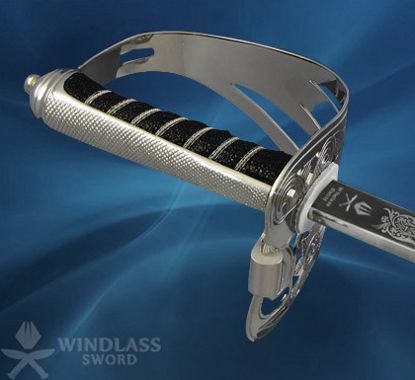 The distinctive characteristic of the HAC Swords is that it has their own badge embellished into the hilt, and their own customized blade engravings symbolizing their specific badge and that of the City of London. 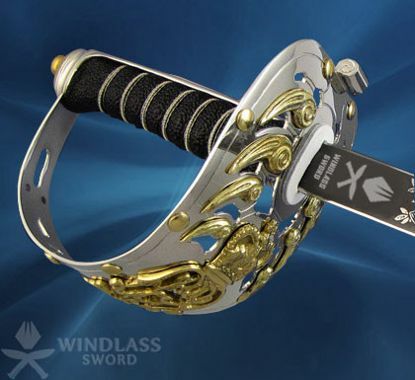 A Sword that is truly a class apart! The Royal Artillery Officer's Sword is characterized by a slightly curved and spear-pointed carbon steel blade. This prestigious sword is said to be based on the 1822 Light Cavalry pattern. 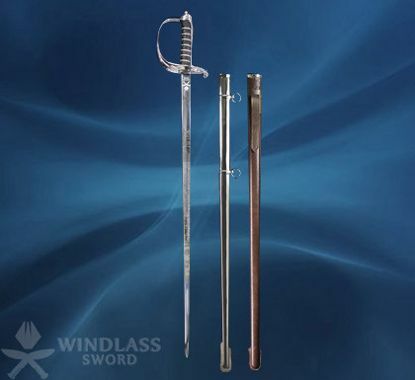 The hilt is a half-basket which has been intricately made of nickel-plated steel and also comprises of three fluted bars. The grip is meticulously crafted in black fish-skin and clenched with silver-plated copper wire. The pommel has been created using stepped design. This fabulous piece of work is available with a Sam Browne leather scabbard with plated steel mouthpiece or in a beautifully nickel-plated steel scabbard. The cavalry sword boasts of daring lancers highly adept in the art of warfare. The 1912 Cavalry Officer's sword is a version of the Trooper's Sword of 1908. It was the last model of Cavalry Officer's Sword to be adopted. The guard of the sword features delicate engravings. 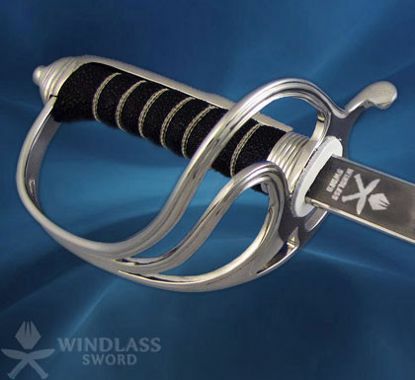 The detailing and authenticity of this sword is enhanced by its carbon steel blade which is magnificently etched including the regimental crest. The nickel plated steel guard features an elegant honeysuckle design. The uniquely shaped black fish-skin grip, wired in silver-plated copper, is capped with a stepped pommel. The double ringed scabbard is available in leather Sam Browne and nickel plating, for service and dress wear respectively. 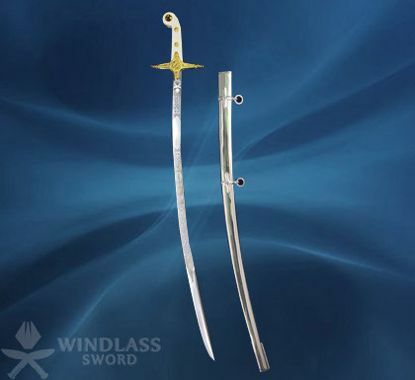 The Cavalry Troopers' Sword follows the design made in 1908 which inculcates a straight cut-and-thrust blade with a plain polished steel bowl guard accompanied with a beaded edge. A unique and exclusive feature of the Cavalry Troopers' Sword is the red vulcanite grip comprising of fine milling and an engraved thumb indentation for advanced handling in the thrust. The intricate nickel-plated steel scabbard accompanies along with it, two fixed rings at the mouthpiece adding more pride to the possessor. The Household Cavalry Blues and Royals' Swords are possessed by officers of the Life Guards and the Blues & Royals during state occasions. This particular 1892 pattern sword is a matter of great honour and pride to the Blues & Royals. Its distinguished with a heavy, single-edged blade which consists of a straight cut-and-thrust pattern. 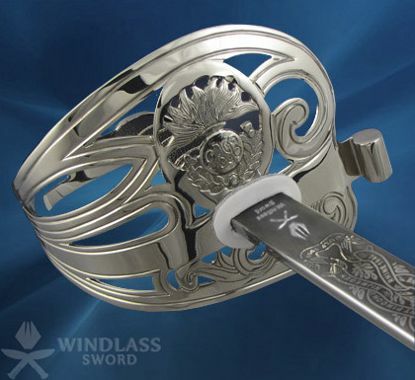 Adding more majesty to the sword is the opulently designed and embedded bowl of nickel-plated steel on which is affixed the ever-magnificent brass regimental badge with brass studs and engravings. 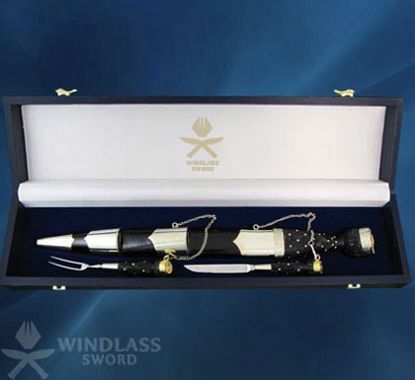 The intricate nickel-plated steel scabbard accompanies along with it, a wonderfully polished brass scallop-shaped mounts and a shoe adding even more pride to the possessor. This is the 1892 pattern sword borne by the Life Guards and the Blues and Royal of the British Household Cavalry,whose motto is Honi Soit Qui Mal Y Pense (Shame on him who thinks evil of it). It is carried on state occasions by the officers. It has a pure cut­-and -thrust blade; heavy and single-edged integrated with ­an ornately chased and pierced bowl of nickel plated steel. A brass regimental badge is attached to it and fixed with brass studs and embellishments. It is a gothic hilted sword and the pommel begins in a brass tip. 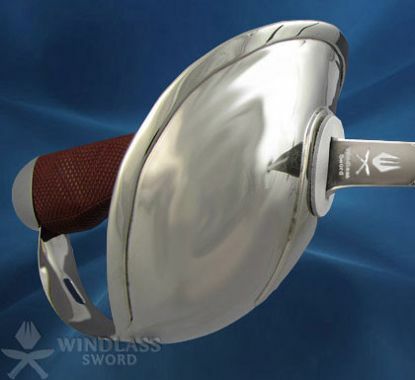 The steel scabbard is nickel-plated and carries brass polished, scallop-shaped mounts and a shoe. Being very much similar to the officer's version, the Household Cavalry Trooper's Sword of 1892 is characterized by a heavy single-edged blade. The bowls is intricately engraved and pricked, with the initials HC intertwined. It also carries the sovereign's crown, thus adding more glory and panache to the Sword. It must be noted that the grip of this Sword is made of wood covered with fish-skin and intertwined with silver-plated copper wire, which is an extreme rarity, making this Sword truly 'a-one-of-a-kind'. 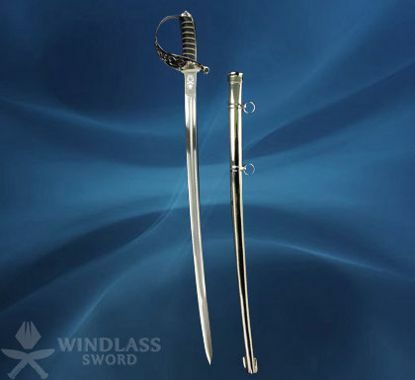 This fabulous piece of work has a scabbard which is made of high-quality chrome-plated steel. The Highland Broadsword is characterized by two-edged cut and thrust sword with a complete nickel-plated steel basket guard. This 1831 pattern Sword is also referred to as the Highland Officer's Sword. The Highland Officer's Sword was initially instigated in the traditional weaponry of Highland Officers. The two major exceptional characteristics of it's hilt are its lining and fringe. The lining is characterized by white buckskin enclosed on the outside with red superfine and its edges crossed with blue silk ribbon. On the other hand, the fringe is comprised of red silk embedded with red ribbon and ties around the pommel and drapes across the front of the basket. This fabulous piece of work is available with a Sam Browne leather scabbard with plated steel mouthpiece or in a beautifully nickel-plated steel scabbard. The General Officer's Sword has a finely etched and distinctively curved single-edged blade which is double-edged for the last 12 inches of its length. This is a Mameluke sword with a crossed hilt made of ivory, featuring gold plated ornamental mounts. The brass guard of the sword is also gilded. The steel scabbard is nickel-plated with two loose rings on cruciform bands and a square shoe. The scabbard is thoroughly designed with a plated chape. These swords were mostly carried as dress or levÃ©e swords by officers of most light cavalry and hussar, and some heavy cavalry regiments in the British Army at various points during the 19th century.